There will be no Masters green jacket ceremony on the Augusta National course at the conclusion of Round 4 on Sunday. Due to inclement weather expected in the afternoon, the iconic post-round celebration of the Masters winner has been nixed in part because officials want to expedite gate closures. "There will not be a Green Jacket Ceremony on the terrace putting green this afternoon in order to expedite gate closures," explained Augusta National in a statement. "Weather permitting, we will have photos with the champion on the putting green following the Butler Cabin Green Jacket presentation." Weather concerns have already played a huge role in how Sunday's final round is developing with tee times pushed up to start at 7:30 a.m. ET and players sent off in threesomes at split tees. Time will tell if the move will allow golfers to finish their final round. 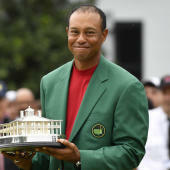 As tradition goes at the green jacket ceremony, the winner of last year's Masters -- in this case, Patrick Reed -- will bestow the newest green jacket onto the back of this year's winner. If we have a Monday finish, which hasn't happened since 1983, it's possible the ceremony will be reinstalled, weather permitting.